Cooler partners with eBay to show the value of re-use. Since 2008, Cooler has worked to help eBay document the environment and energy benefits of extending the meaningful life of products. We've conducted ground-breaking, peer-reviewed research and built great software to show how goods sold on the eBay trading platform help reduce energy and emissions in product manufacturing, distribution, retailing and disposal. As eBay says: "The greenest product is one that already exists." How does Cooler come up with these numbers? The foundation for the analysis is Cooler's carbon calculation technology, which is based on economic input-output models and analysis developed by OpenIO, and at Carnegie-Mellon University, UC Berkeley, and research institutions around the world. Since the approach is economy-wide, nothing is left out. How can re-use save so much energy and reduce greenhouse gasses by this much? At Cooler we like to say "It's the stuff, stupid!" Except for things that use a lot of energy (like cars and refrigerators), most of the environmental impact of a product comes from its manufacture. The next most impactful part of shopping is the retail and wholesale infrastructure necessary to get goods in front of you in a store. Then comes disposal.When a product is re-used and sold on eBay's peer-to-peer platform, the bulk of these impacts are eliminated. In some cases, Cooler passes some of the new-product footprint on through to the used-product purchase, particularly when the item is customarily bought with the intention to resell eventually, as in the case of a car purchase. Check out one of our case studies for eBay. 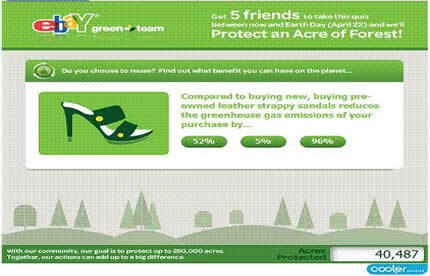 Take eBay's Greenteam Facebook Quiz, or contact us for more information.